With the outdoor exhibition season fast approaching, we have come up with 3 tips to help you avoid typical mistakes that can affect the outcome of your exhibition. You want to ensure that the possibilities for your business and your brand are endless and easily attainable. Creating an outdoor exhibition stand that is impressive, effective and has all the elements it needs to be successful, can be difficult. Here are three easy yet impactful solutions to avoiding exhibition fails. Every member of staff attending an event should understand the importance of brand image and are clear on how that can translate into what they should be wearing on the day. Nothing says unprofessional more than a scuffed-up appearance. Your appearance is important whether exhibiting at the event or simply attending, you should always be smart and well presented. Whether or not you have a company uniform, a branded fleece or t-shirt often work well at exhibitions and help increase your brands presence whilst on the stand or roaming the exhibition. Branded clothing helps visitors identify staff quickly and is crucial for maximising lead potential as you want your visitors to be able to identify who they need to speak too. If you are not easily found, you may find visitors don’t bother engaging with you on the day. We all want to feel comfortable, especially when outside. Outdoor events can vary from being rainy and cold to unbearably hot. Its hard to engage your most enticing sales pitch or make those crucial connections when you are cold, and you can barely feel your toes, or feeling so hot that you are struggling to breathe. To avoid this, you must ensure that you are prepped and ready to dress accordingly at the weather forecast. It’s a good idea to carefully watch the weather forecast in the days leading up to the event. Always opt for comfortable and sensible footwear that is suitable for your event. You need shoes that you can wear all day long with as little discomfort as possible. Layer up! If we have learnt anything from traditional English weather, its that it is highly unpredictable. By layering your clothes, you have the option to remove layers if the sun does decide to make an appearance. Equally as important, if sunny weather is predicted then ensure you take appropriate clothing which will shade you from the beaming sunshine. When exhibiting at an outdoor event, the location of your exhibition stand must be carefully selected, some businesses choose to book their space up to a year in advance to guarantee the best possible space. The landscape can be a major risk when placing your exhibition stand. From inclines to potholes, you are never truly aware of what the foundation may be until you are on site so try to attain as much information about your surroundings prior to the event so you are well prepared. Booking your stand location early will also give you the option of choosing a space which is going to maximise the amount of foot traffic that passes your stand. You may also want to research the show layout prior to booking your stand space so you can be close to the main attraction, centre stage or performance ring. Being close to these can mean your brand is seen by more people. Go big or go home. Your exhibition stand needs to stand out and make a huge impact visually. There are fewer restrictions on dimensions when you are exhibiting outdoors. Height is almost never a concern and the spaces tend to be much larger. This can be taken as an opportunity to really draw the attention to a truly impressive exhibition stand. We offer a huge range of outdoor displays which are designed to maximise your brand potential. X-GLOO Inflatable Event Tents are designed to take your brand to the next level. Offering a range of sizes which are truly customisable to your brand. Create large tent cities by linking multiple X-GLOO event tents together. Almost every surface of the X-GLOO event tents can be branded and customised. Create the ultimate marketing experience using the Signus ONE Inflatable Marketing Pavilion. The futuristic shape creates an experience like no other. Available in a range of sizes to suit any outdoor event space. 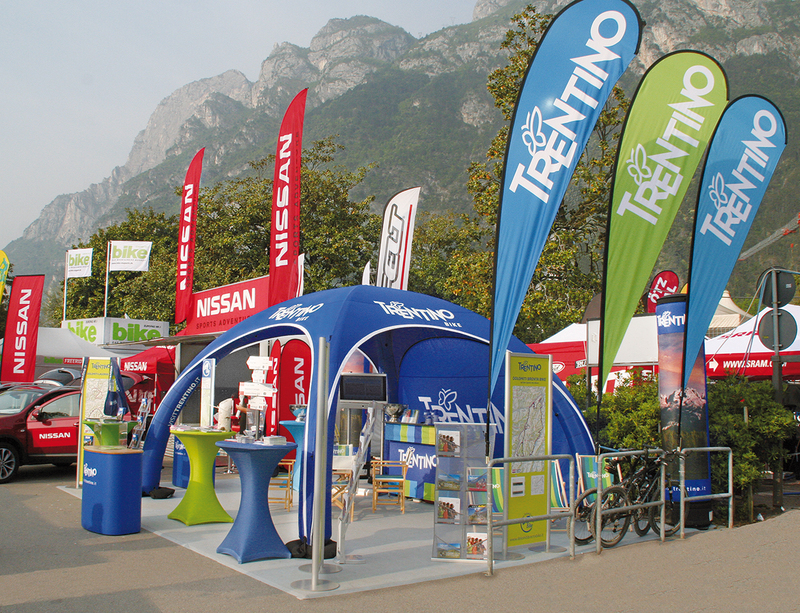 Our promotional flags are perfect for adding height to your outdoor exhibition stand. Available in a range of heights and styles to create a show stopping display. Feather flags are our most popular promotional flag and come with a choice of 8 inclusive bases and a free carry bag. Out inflatable arches can be fully branded and come in large sizes which are perfect maximising your brand exposure from afar. The inflatable arches are ideal for use at sporting and motor sport events and can also be used to create an entrance and exit for outdoor events. This can especially be a useful tactic in a live demonstration of your product which can create a committed audience. An engaging product demonstration can become one of the most beneficial experiences that you can provide your attendees, as it gives them something to remember when leaving the show. There is so much that you can do with an outdoor space, the possibilities are endless when it comes to outdoor exhibiting. For all of our printed products you can provide your own artwork. Alternatively we offer a full, in-house graphic design service and can work with you to design your outdoor display product to your brand and specifications. For more information on our outdoor display products, promotional flags or the X-GLOO Inflatable Event Tents please contact us or call our sales team on 01733 511030.